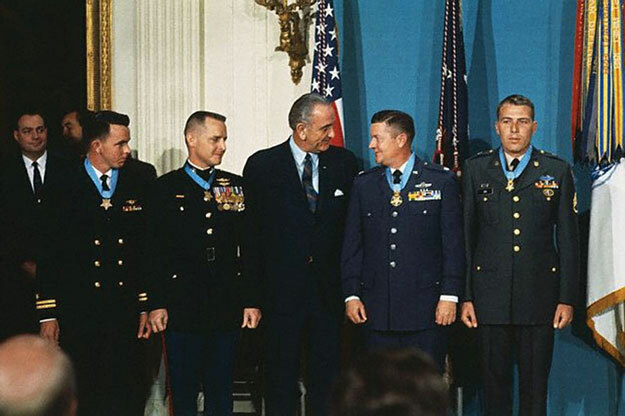 Medal of Honor recipient Joe Jackson passed last Sunday. He was 95. A retired Air Force colonel, he was a veteran of World War II, the Korean War, and the War in Vietnam. During Monday evening's Lakewood City Council meeting, Mayor Don Anderson called for a moment of silence in acknowledgement of Jackson's service. Born in Newnan, Georgia, Jackson enlisted in the Army Air Corps in 1941 as America entered WWII. He became a crew chief on B-25 bombers, and later earned a commission and his wings. He flew P-40 and P-63 fighter aircraft. Toward the end of war, he piloted B-24 bombers. Jackson remained in the newly formed Air Force (1947), returned to flying fighters, and flew 107 combat missions during the Korean War. After that war and serving as a war planner in Europe, he received orders to go to Vietnam. On May 12, 1968, he flew into Air Force history. "Negative, negative. I left three members of the combat control team behind," Jackson heard on his headset. Kham Duc, a special forces outpost, was under heavy attack by North Vietnamese and Viet Cong soldiers, and three airmen had been left behind. Undeterred, Jackson took a C-123 down in a dive, leveled off about 50 feet above the ground, and touched down at the very end of the airstrip -- of which only 2,200 feet was serviceable -- and hit the brakes. He caught the enemy by surprise. As Jackson brought the aircraft around, the airmen jumped in. Seconds later, the co-pilot yelled that a 122mm rocket has been fired at them. It skidded down the runway, broke in half, and stopped just shy of the aircraft's nose. Completing the turn and with the words, "Let's get the hell out of here," Jackson applied full power and lifted off using only about 1,000 feet of runway. "I'm the luckiest guy in the world," Jackson later said. He also said afterwards that his plane had not been hit. Retiring from the Air Force in 1974, he worked as a training instructor in Iran for Boeing until 1977. In a 2013 interview with the Air Force Times, he said that his service and Medal of Honor represent "the thousands of Americans who have served their country." Col. Joe Jackson Boulevard at McChord Field is named in his honor.